Sister Anne Fleming, S.C., a Sister of Charity-Halifax, Nova Scotia, for 69 years, died Nov. 23 at Victoria General Hospital, Halifax. She was 87. She taught second, fifth and eighth grades at St. Sebastian School, Woodside, 1951-56, before moving to Halifax, where she ministered for the rest of her life. 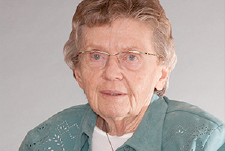 She was the provincial superior of the Sisters of Charity, 1980-88, and retired to Caritas Residence, Halifax, in 2018. She is survived by her sister, Eileen Sameski and brother, Paul Fleming. A Mass of Christian Burial was celebrated Nov. 28 in the Immaculate Conception Chapel at Caritas Residence. Burial was in Gate of Heaven Cemetery, Lower Sackville, Nova Scotia. I was in 2nd Grade, during her last year in St. Sebastian’s. I might remember her, if I know her religious name. I had Sr. Marion Dennis that year, in 2nd Grade. She sadly passed away in September, 2012. I had Sr. Anne Walter for first grade (1A) at Sebastians from Sept 1955 to Jan 1956. I do not know if this is she.